2009 was a defining year for Vanessa Spolidoro aka Vanita. In that fateful year caused by various factors, the idea and experience the desire to celebrate music itself, and create. The music area where Vanita feels at home was already established from the beginning. The rich, driving and a formal motion calling for the minimal techno beats have always been here to Vanita and guide them each day anew. Vanita, a spirited 25 year-old woman with Italian roots, convinced - not only behind the DJ-table but also as a person. She enchants, fascinates and captivates. Can you present us a talent like few have, and inspired by the unwavering motivation and everything meaningless look ahead! Since 2011 she is working on new deep house & tech house tracks and operates with Low.tales an own label called rave of love. 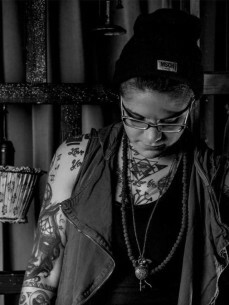 Here is an artist with both style and passion.Meanwhile she counts as a component of the hive club as a resident DJ.